In FY16, FedEx reached new heights as one of the world’s unique enterprises. Through disciplined strategy and execution, our shareowners, team members and customers benefited greatly from new solutions and higher revenues and profits, despite an environment of low economic growth. In FY13, we stated we would meet the FedEx Express profit improvement goal — to exit FY16 with an annual run rate of $1.6 billion in additional operating profit — and we did it. Moreover, we believe FedEx Express profitability and productivity will continue to increase for years to come, assuming continued modest growth in the U.S. and global economies. We announced we would acquire the Dutch delivery company TNT Express in the first half of calendar 2016. We officially acquired the company on May 25. We committed to continue improving FedEx Corporation’s margins, earnings per share, cash flows and returns over the long term. We successfully advanced each of these goals in FY16. To achieve our stated mission to produce superior financial returns for shareowners, we manage our operating companies as a portfolio of solutions. 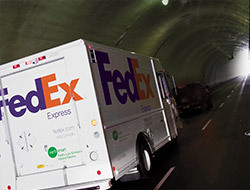 Customers as well as FedEx benefit: Ninety-six percent of U.S. revenue is generated by customers using two or more of our transportation companies — FedEx Express, FedEx Ground and FedEx Freight. About 77 percent of U.S. revenue comes from customers using all three transportation companies. 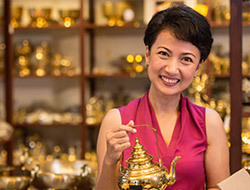 Our customer base is large and diverse by design. No single customer represents more than 3 percent of our total revenue. Our investments are paying off, and we expect positive financial momentum to continue into FY17. While we integrate our acquisitions, we’ll continue our successful investments in FedEx Express aircraft fleet modernization and expand the capacity of the highly automated FedEx Ground network. We expect these major programs will have high returns, which are integral to expanding corporate margins. It is important to stress that we manage our operating companies collaboratively to achieve overall results for FedEx Corporation. This means we do not necessarily maximize the profitability of each FedEx unit every year. And because our operating companies compete collectively as a portfolio, we are often funding initiatives that may incur costs for an operating company in the near term for long-term benefit to the enterprise as a whole. From FY14 through FY16, FedEx returned more than $8.8 billion to shareowners through our repurchase of more than 63 million shares and increased dividends by at least 25 percent annually. Our strong balance sheet, profit and cash flow performance gave us the flexibility to sustain stock repurchase programs while continuing to execute our strategic growth initiatives. The TNT Express acquisition broadens our global portfolio and gives FedEx a global competitive advantage that will deliver long-term shareowner value. As we integrate TNT Express, the density of its powerful pan-European surface transportation network will make our operations more productive and efficient. Combining TNT Express with our intra-European and intercontinental FedEx Express services lowers our costs to serve the market and puts us front and center to profit from the growth of European commerce. After acquiring TNT Express, we were able to hit the ground running thanks to our detailed integration planning process, and we’re confident we’ll successfully integrate TNT Express with FedEx Express. We expect TNT Express to be accretive to earnings in FY18. Longer term, we anticipate this acquisition will generate substantial improvements in revenue and earnings. We are already reaping the rewards of our acquisitions in FY15 of GENCO, part of our FedEx Ground segment, and Bongo International, recently rebranded as FedEx CrossBorder, a unit of FedEx Trade Networks. Thanks to complementary FedEx and GENCO transport management logistics services, we’re successfully working with customers to cross-sell our capabilities, including GENCO’s unmatched expertise in returns. Retailers highly value this service, because reverse logistics costs for consumer goods average 8 percent of total sales. FedEx CrossBorder is expanding services to merchants in China and Japan this year, enabling shoppers to purchase goods internationally through a seamless checkout and delivery process that takes the guesswork out of what the total landed cost will be, including international duties and taxes. 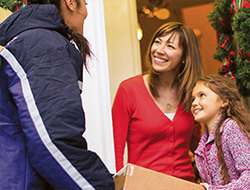 The 2015 peak holiday season was historic by many measures, and our team members responded to the challenge by delivering our Purple Promise, which simply states: “I will make every FedEx experience outstanding.” They handled record demand, delivering more than 25 million packages per day on multiple days, more than double our average daily volume. Their stellar performance and close collaboration with our customers helped us achieve holiday season service levels that were among the highest ever, despite higher-than-expected volumes and difficult weather in some locations. Thanks to our team members’ commitment to the customers and communities we serve, we were proud to be once again recognized by FORTUNE magazine as one of the world’s 10 most-admired companies and No. 1 in the delivery industry. Our unrivaled transportation networks provide competitive advantages for our customers. 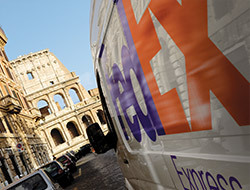 FedEx Express is the world’s largest express transportation company, with an unmatched global flight system. FedEx Ground continues to increase market share and is faster to more U.S. locations than its competitors. FedEx Freight is the less-than-truckload (LTL) market leader with similar transit advantages in its sector. FedEx Office provides unique digital print and package services. Given these facts, we believe reports warning of possible near-term disruptions to the package shipping industry by new local delivery business models to be fantastical, devoid of in-depth knowledge of large logistics systems and the markets FedEx serves. Our dense, ubiquitous networks create fundamental scale and scope advantages that aren’t easily replicated. Nearly every business and person on the planet can order an item online and have it affordably transported and delivered door-to-door by FedEx across borders within one or two business days, customs cleared. For e-commerce to continue to grow rapidly, our efficient and reliable global transportation solutions are vital. FedEx Express. Profit improvement initiatives have been successful, and we plan to continue increasing margins. For example, every aircraft we replace with a new Boeing 767-300 Freighter adds millions of dollars annually to profits because the new planes use 30 percent less fuel, are more reliable and require less maintenance expense than the older planes they replace. FedEx Ground. We’ve nearly tripled our ground market share during the last two decades and continue to widen our competitive advantage by investing in highly automated facilities that can quickly process growing volumes of packages. To gain even more operational efficiencies and flexibility, we combined our FedEx Ground and FedEx SmartPost networks and are introducing new routing technologies to make our deliveries more efficient, particularly in residential areas. FedEx Freight. We’re enthusiastic about our efforts to extend our market-leading position by reshaping the LTL market, just like FedEx has done in both the express and ground segments. We are connecting customers with more convenient, parcel-like shipping solutions, such as zone-based pricing and the recently introduced FedEx Freight box, a simplified way to ship LTL that increases security and shipment protection. To more accurately cost and price LTL shipments, we continue to expand our use of dimensional scanners. FedEx Services. Yield management is a critical component of our financial success. We continue to sharpen our revenue management and pricing science. Our world-class pricing group analyzes revenue data to better balance volume growth and yield improvements. We’re currently evaluating and executing multiple pricing initiatives to increase margins and profits. We are just as focused on simplifying and modernizing our information technology footprint, which lowers costs. As we do so, we spend less on infrastructure and upgrades. Equally important, these information technology initiatives make FedEx more agile and flexible in meeting customers’ needs. FedEx Office is at the center of solutions designed to handle large volumes of e-commerce shipments while making it easier for customers to pack, ship and pick up packages. Across the country, we’re also piloting neighborhood third-party retail locations to supplement our convenience network. Delivering is our business; doing it sustainably is our responsibility. We committed to increasing FedEx Express vehicle fuel economy by 30 percent by 2020 from a 2005 baseline, and we surpassed our goal ahead of schedule. In FY15, FedEx nearly doubled the number of alternative fuel vehicles in our global fleet, including approximately 1,900 hybrids, electric, compressed natural gas, propane auto gas and hydrogen vehicles. Please take time to review our Global Citizenship Report at csr.fedex.com. It outlines current goals and the progress we’ve made, plus our pledge to invest $200 million in 200 communities worldwide by 2020. In November 2015, we welcomed John C. Inglis, former Deputy Director of the National Security Agency, to the FedEx Board of Directors. His cybersecurity and information technology expertise and significant leadership experience will be very valuable to FedEx, particularly as a knowledgeable expert on our Information Technology Oversight Committee. FY16 was a year of significant accomplishments, and we plan to build on this success for many years to come. By creating new solutions for our customers, we help them grow and prosper. We continue to advocate trade and economic policies that create opportunities for business while helping the communities we serve flourish. FedEx is committed to the highest standards of regulatory and legal compliance, acting with integrity in everything we do, everywhere we do business. Ethical conduct supports the reputation FedEx has earned as one of the most admired brands in the world. As we’ve demonstrated, we’ve done the things we said we’d do. We predict a bright future for FedEx, and based on our record, we hope our customers, team members and shareowners have confidence in our commitment to their success as well.